Throughout the month of December, I had been hearing about other parents being concerned that their children are growing skeptical about the existence of Santa. I know that the same concerns are not too far off in my future since our son will be turning six years old soon. Last year, I had heard about iCaughtSanta.com, but it was not until this year that I tried out their services for myself. Basically, for $9.99 you can digitally insert Santa Claus into one photo you have taken inside your home. For $19.99, you can use four different photos. There are 20 poses to choose from, including full-body Santas, close-up Santas, and even Santa enjoying milk and cookies. You can adjust the Santa image's size, brightness, color, placement, and you can even flip it from left to right. All these things help Santa to blend into your existing photo. The only thing I would say that was missing is the ability to add a shadow. After you have finalized your photo, you can download and save it to your computer. You can also share it through a vast number of online social networks including Facebook, Twitter, and Blogger. You can also email the photo to your friends and family. 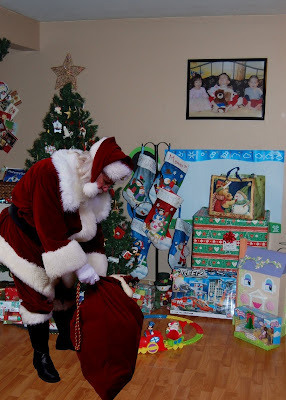 If your child needs even more proof, another service provided by iCaughtSanta.com is a video with Santa moving around a background you provide in the form of a photo. In addition to printing the photos right on your own home printer, you can order prints to be picked up at your local photo place. Other characters I am anxious to try out in the future are the Easter Bunny and the Tooth Fairy. My husband and I work so hard to help our children believe. I really do think that these photos will help the magic live on for just a little bit longer. Thank you to iCaughtSanta.com for providing me with coupon codes to try their services.